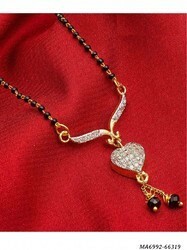 Indian Manufacturer of Ladies Fancy Mangalsutra. Only for Wholesale, Exporter, Distributors, Shop owner reseller and online seller all kind of artificial jewellery , imitation jewellery, Victorian jewellery costume jewellery and diamond replica jewellery cubic zirconia jewellery made with finest quality material. We are a prominent entity in the market, affianced in offering the finest quality of Designer Mangalsutra. We are offering Imitation Jewellery - DSCN0194. 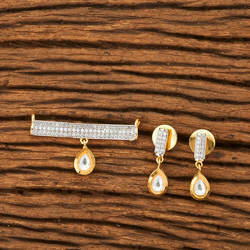 We are presenting a this beautiful mangalsutra set comprising CZ stone, which makes it extremely attractive. These designs are widely appreciated by our clients all across the globe.